Decorate your room for a nautical or a marine fishing expedition with our help. We have plastic fish wall decorations, plastic seashells, and fish netting to make your theme look authentic. If you are having an ocean theme party we can help you get your party headed out to sea. Decorate like you are on a boat! With our Cruise Ship Porthole Peel 'N Place Decal, place these decals on your wall so it looks like you are on a cruise ship instead of in your house. If you are having a Under the Sea party our Undersea Backdrop and props will be perfect. It will make your guests feel like they are really living under water. For a little extra effect, hang Blue Tissue balls from your ceiling at different heights along with our Tropical Fish. This will really make the guest feel like they are swimming undersea. Set sail to new adventures with Nautical Party Decorations. Below you will find everything you will need for a fantastic nautical party. If you want an ocean theme party or perhaps a fishing theme party, we have the decorations you need to transform your boring room into an ocean-side town or pier. Hang fish netting from the walls and ceiling to make it look like you just came back from a catch. Make it even more realistic by placing some Fish Cutouts in the netting as well. Use the Anchor Garland to give your room some color with these alternating tissue anchors. Ocean themed parties are also great for people who are going on a cruise. Check out each of our backdrops to take our decorations to the next level. You can also use nautical party decorations for a classroom theme. 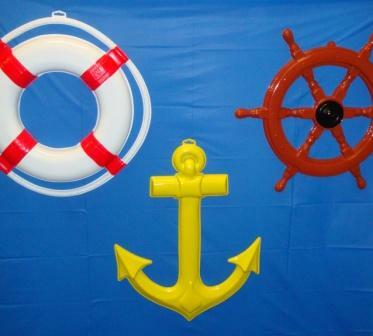 Check out our article on How to Decorate for a Nautical Theme Party to learn more about how to pull all of these decorations together to create a nautical theme classroom to promote an interesting learning environment for your students. If you just want some ideas on different decorations, check out the top 10 nautical theme party decorations at the bottom of that article. Make sure you read the entire piece though! Have fun making your nautical party come to life like the creatures swimming in the deep blue sea. Turn an ordinary room into your own nautical scene by decorating with our fun nautical props. Use the Plastic Life Preserver all around the party. It’s made of plastic and easily attaches to the wall. You need this at the party. Everyone knows that a captain won't get far without his ship’s helm. Be sure to incorporate the Plastic Ships Helm into the party. The Plastic Ships Helm is made of brown plastic with black accents. Another fun favorite is the Assorted Plastic Ships Anchor that is a whopping 25 inches tall. These three accessories can be placed anywhere around the party to add even more decoration and they can be reused for your upcoming parties!